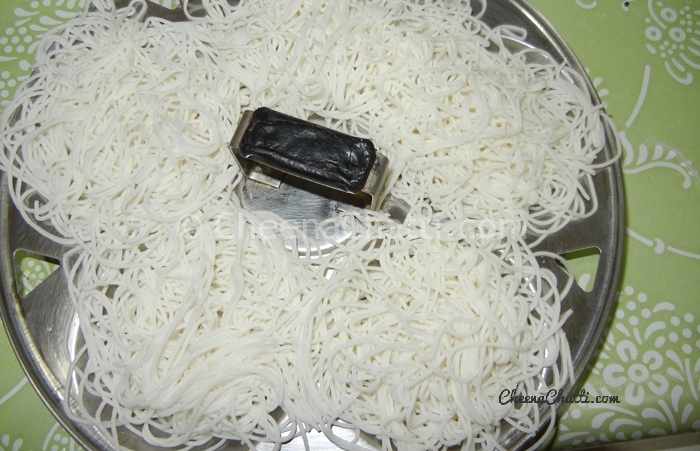 Iddiyappam aka “Noolappam / Sevai / String Hoppers” made by steaming process is a common breakfast food item in Kerala, Tamilnadu, Karnataka, Lakshadweep and Sri Lankan Tamil people. Idiyappam can be served with vegetable curries, Korma, pepper chicken, egg curry etc. Its an extremely easy to prepare breakfast dish, if you have an easy to handle idiyappam maker. Its one of the favorite breakfast dish of my family. As its a soft food, small children, elderly people etc can enjoy it. Small children always like to have this with grated fresh coconut and sugar. Add salt to water and boil it. Into a medium sized bowl pour the boiling water and add the rice flour stirring continuously. Even if lumps are formed, it doesn’t matter. For 2 cups of powder, we take one cup of water. Mix and Knead well until the dough becomes soft. Apply a thin layer of oil to the idiyappam steamer and sprinkle a thin layer of grated coconut over it. Squeeze the prepared dough slowly through an idiyappam maker into an Idiyappam steamer (or an idli maker) and sprinkle the grated coconut over it. 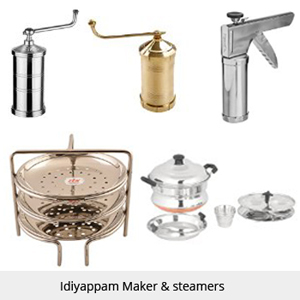 There are multiple types of idiyappam makers available in the market. Buy an easy to handle one. Some needs the help of a second person to operate. Do not steam it for long time, around ten minutes is enough. Keep the dough covered with a wet cloth all the time, to avoid the dough from drying out. If the dough is too tight, it would be difficult to press it. Adding around 1 tsp of oil to the water in step 1 makes it easier to squeeze the idiyappam through the maker. Want to learn more kerala recipes? check these. This entry was added on April 1st, 2013 by Reeja MytheenKunju in Breakfasts and Dinners and tagged with kerala idiyappam recipe, kerala idiyappam, easy idiyappam recipe, best idiyappam recipes, how to make idiyappam, breakfast, kerala idiayappam, easy idiappam, idiyappam. Last revised on April 4th, 2018. Recipe & Recipe photo contributed by Seethalakshmi N.
Hello there, I am Reeja MytheenKunju. I am a bit lazy house wife living in Dubai with my loving husband and my kid Kunju. Like you all, I love food and spend my free time (if any) in Kitchen. For those who want to experiment with Kerala recipes, it would help if the amount of water is mentioned in this recipe. Is the dough similar to the dough for pathiri? If so, water should be the same amount of flour taken. If it is different from pathiri dough, could you please add the amount of water required? Also since you have written not to overcook the idiappam, could you mention how much time is required for steaming? @Mrs Sheikh : Greetings. The dough should be softer than that for pathiri. If the dough is too thick, it will be difficult to squeeze it through the Idiyappam maker. Steam each set of Idiyappam for approximately 2-4 minutes. PS : I updated the post with these details. Dont forget to share your out come with me. Thank you Maya for trying the recipe and for dropping your comment!